❏ Today in Part 6 of my series on 10 Slides to VC Funding Success, I’ll speak on 6: Pitch Deck Competition Slide – 10 Slides to VC Funding Success (Link). The Competition Slide is the sixth page of every successful VC Pitch Deck. After having discussed the Traction slide, you should immediately launch into describing your Competition. When you look at your Competition, be honest. You likely have publically traded large competitors. Offshore competitors may exist. Also, there may me have startup competitors. Your Competition Slide should include all of these. What is the Competition? You will learn in this article the answer to this question and what is essential to show on your Pitch Deck Competition Slide. Pitch Deck Competition Slide – Why Important? Last week in 5: Pitch Deck Traction Slide – 10 Slides to VC Funding Success (Link), I spoke about the Traction slide and its importance. This week I’m talking to the Competition Slide, the sixth page of every presentation and its significance. After having discussed the Traction slide, you should immediately launch into describing your Competition. Why? First, you’ve walked your audience’s through your customer Traction, your Solution, the Market for the Problem. Their brain is now poised to hear who your Competition is and why they won’t stop you! Look at the example image for this post. What do you see? A table of rows and columns with a title. A Feature titles each row in the table. 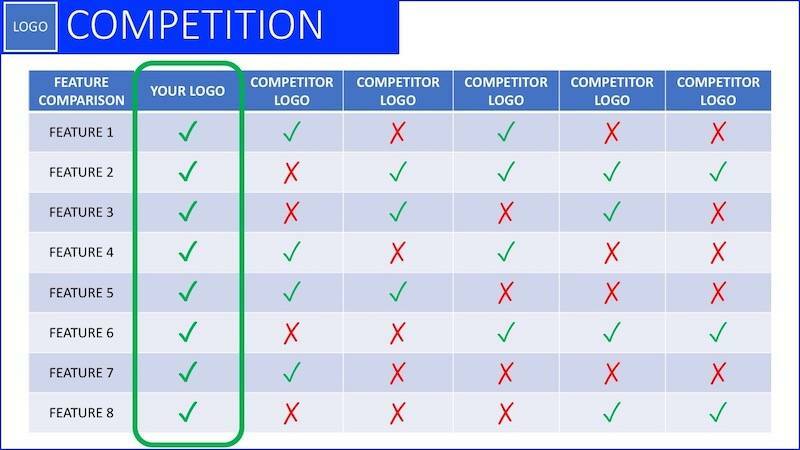 Each column is headed with a logo, beginning with your own, then Competitors This slide is where you highlight the top 5-8 features that you have, that your competitors don’t. Your company column is leftmost and all green checkmarks. Your Competitors have some of your features, but not most. Where they don’t have a crucial element, show a gray dash. This slide is where you get to “shine” on your depth of understanding your Competition. Who are your competitors? How big are they? What is their market share? Why do customers buy from them.? What are the key features of a Customers perspective? Why are these features important to them? How difficult is this feature to manufacture or duplicate? Is the feature patentable? Which Competitors are startups? Which are divisions of multi-billion USD companies? Why won’t the competitors simply “clone” you in weeks or months? Does your Solution hold the makings of a Company or it is just a Product? Pitch Deck Competition Slide – What’s Your Story? So, what do you say while your Pitch Deck Competition Slide is visible? Pick three critical product attributes out of the list that highlight the Problem you described. Give each feature 15 seconds and discuss why your Customers MUST have this feature. So many Entrepreneurs say “We don’t have Competitors.” No Competition is a fatal statement to make in raising money from experienced Investors. You’ve just told them that you’re inexperienced and don’t know your Market. For every Problem, there is some Solution. Even if you invented Teleportation, that has Competition. The car, plane, bus – your legs – can get you from A to B albeit less fast. 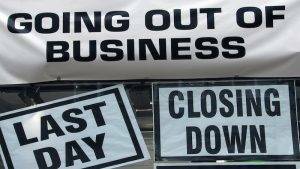 Your Solution likely has existing brute force solutions, large corporate Competitors, and other Startups. Know who they are, they’re market share, and for other startups, who are funding them and how much. You won’t talk about all these things on this slide, but you could be interrupted and asked these questions. Here’s one example. “There are seven key features our Customers are desperately seeking. Here you see our Solution satisfies all seven while our closest two Competitors, only satisfies two. One competitor is a three-year-old startup that has raised USD 12M. The other is a division of XYZ corporation. Unlike our competitors, we have both an online Customer and Channel portal. The competition makes customers and channel partners call them by phone. Our customers estimate annual savings on these two features alone are over USD 100K. Our third key feature is our single-click, Customer registration via a free branded iOS and Android app. At one customer, this has already increased product registrations by 2X allowing product up-sales of over $100K.”. Wow! As an investor, I’m getting even more excited by this startups story. Are you? So, I suspect many of you were surprised concerning the importance of the Pitch Deck Competition Slide. If you’re starting you create your first investor presentation, congratulations! You’re going to be starting on the right foot if you follow my recommendations above. Go back and look at your Competition slide and apply what you’ve learned above. If possible, you should wait to read the remainder of the series before you present again. I can almost promise you a better reaction from your audience.